This is an impressive wah - well-made and at a good price. 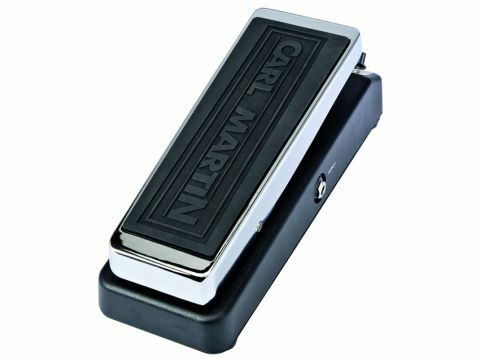 We'd suggest trying it first, as flicking between modes can become a little too easy, but the sounds on offer are as good as we expect from Carl Martin. The concept is a good one and the tones are uniformly excellent. That mode switch is a little too sensitive. The 2 Wah actually includes a total of six differently voiced wahs and, although you can only access two of them at any one time, the breadth of tone available and the potential for serious versatility is already a given. There are two basic modes - high and low - which are further divided into a trio of choices for each. An attack control, also sited on what passes for a front panel on any wah, allows for an efficient fine-tuning of the effect. The trick with the 2 Wah lies in the subtle manipulation of the treadle. As you'd expect, pushing forward turns the wah on and off, and we found that it didn't really require too much pressure to operate the switch. Heeling down on the treadle engages a second switch, one that toggles between the low and high modes; you simply need to choose which of the three relevant settings of each you want to use and away you go. The sounds are described as recreations of classic and vintage wahs, and Carl Martin's recommendation of using one for your rhythm duties and another for your solo work proves an effective approach. There's no getting away from the sheer quality of the wahs that are on offer here, but we did find that an overly exuberant rocking of the treadle did tend to cause us to inadvertently change modes, which is a shame.